Compare what we find in the Gospel of Mark. The table is slightly modified from Winn’s. (I have corrected typos — there are many typos in the book — and misalignments and added bolding.) One can see how the evangelist has quite likely broken up the consecutive narrative in 2 Kings 2:1-11 about the imminent departure of Elijah and his instructions to his disciple, Elisha. The Gospel scatters the three stages of the Elijah narrative through a longer narrative, and in addition reverses some elements of the original (e.g. the statements of understanding on the part of Elisha are converted to confusion and misunderstanding in Mark). This point might scarcely need further demonstration. It has been clear in the examples already given. See, for example, in my previous post the comparison of Mark’s leper being lowered through the roof to be healed by Jesus with the narrative in 2 Kings of the king falling through the roof and being condemned to die by Elijah. Still, omission of details can sometimes blind a casual reader to a source. Such a reader may sense some sort of resonance with an earlier account in the Old Testament (or even in Greek literature) but not be able to put a finger on exactly what the relationship might be. Awareness of the technique of omission helps us identify what is going on. Here is another example from the Gospel of Mark. But there is much detail in the former story that is omitted from Mark’s. In 2 Kings the leper, Naaman, expresses indignation when first instructed to wash in a river; Naaman’s relationship with his king is explored within the same narrative; Naaman offers a reward, etc. But of course none of these details served the purpose of the author of Mark’s Gospel. Again we have observed this technique in the earlier examples above and the previous post. Another illustration Winn offers to help grasp the wider understanding of how an imitator will alter details, because sometimes it is different details that can hide a source from the mind of the unwary reader, is Virgil’s “conversion” of a song in Homer into a work of relief sculpture. 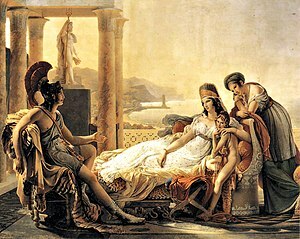 While Homer’s Odysseus was being entertained in the court of King Alcinous a bard, Demodocus, entered and, without knowing who Odysseus was, began to sing of hardships Odysseus himself experienced in the recent Trojan war. All expressed pleasure at the beauty of the song but Odysseus wept. In Virgil’s epic Aeneas was waiting at the Temple of Juno for his hostess, Queen Dido, when he saw the events of the Trojan war depicted in magnificent artwork on the temple’s walls. Like Odysseus, we wept at the bitter reminders of his recent experiences. Imitation does not mean that details cannot be omitted, reversed or changed. Intensification is comparable to Dennis MacDonald’s criterion of “transvaluation”. The new hero is shown to be greater in some way than the one on whom he is modeled. So in the above example of the healings of the lepers, where Elisha instructed the leper to go and do certain washings in order to be healed, Jesus was able simply to touch the leper to heal him. One more of a number of examples of intensification that Winn draws to our attention in Mark’s Gospel is found in Jesus’ calling of his disciples. Elijah finds one disciple, Elisha; Jesus finds two disciples, Simon and Andrew, then another two, James and John. Jesus not only calls more disciples than Elijah; the disciples he calls are more willing to leave their families without hesitation. Jesus is being depicted as having a greater power and influence than his predecessor. Next in this series will look at criteria Winn considers for detecting literary imitations. Posted on 2012-05-05 09:56:17 GMT+0000 by Neil Godfrey. This entry was posted in Biblical Studies and tagged Aeneas, Gospel of Mark, Homer, Odysseus, Virgil. Bookmark the permalink. The line about Circe reminds me of another interesting fact about what we in English call places of worship, churches. Wiki gives a different etymology stating that Church is somehow related to Kurios or Lord. Ive heard from other books, that Church comes from terms such as Kirk which has roots in Circe. Circe was the goddess who was well known for drugs, herbs and hallucinations which is a fairly accurate representation of definition of what belief is. Somehow i think the ancients were trying to convey some feelings about churches and what are truely are. As with many things one can change the definition of what a word means or is perceived to mean nowdays but the etymology is often very releaving. Of course its not always easy to find out what a word originally meant way way back in time. I cant recall which book, i will have to check a few. Perhaps google might be your friend or someone more familiar with etymology of church terms may be able to help. Speaking of etymology the names of the positions of the church is also interesting for the same reason, nearly all are related to the zodiac in some way. Somehow i doubt that many false friends can possible all be coincidences, there is definitely a message hidden in there. I tried searching before I posted. Google; etymological dictionary (paper! ); memory. Which is why I enquired. Perhaps if you chance across, or remember, the source, you will post it here? Thomas Verenna has written an excellent [IMO] article on “Did Jesus Exist?”. Thanks, it was excellent. Certainty, indeed. Can you tell me how to contact Thomas? Great stuff Neil but as the foremost authority the world has ever known on “Mark” I feel it is my responsibility to add something. Understanding that the table is a summary of someone else and not you, the critical 2 Kings 2:1-11 verses Mark 8:27 – 10:45 starts with a SPECIFIC prediction, that the hero will bypass death (like Markio jumping over a Bar-El). As a bonus, note that the start of each excerpt is also at the START of the respective stories it is a part of which I think can be added to Clark’s related criteria. “Mark” often uses this literary technique within, such as the name “Gerasa” being at the same position within its story as the phonetically matching “Jairus” in its complimentary story. The second addition is that rather than an understanding/misunderstanding diekatame, it is an acceptance/REJECTION one. Here in “Mark” Peter is explicitly rejecting. I think “Mark” has a related theme throughout that when the text shows “misunderstanding” the subtext is rejection. And third (just to maintain “Mark’s” style), the faithful vs. teaching discipleship is better described as positive vs. NEGATIVE discipleship. Note that in the original Gospel, “Mark’s” Jesus is primarily interested in portraying the Disciples as failing Jesus by defining disciple failure and than having the disciples explicitly meet that definition. I believe you have already been converted to accepting that Paul was a major source for “Mark” but observe how well the above fits with Paul. The irony of course is that Christianity (Paul/”Mark”) started with the insistence that historical witness did not understand/accept what Jesus was and subsequent Christianity is built on the claim that they did. I think everyone here accepts that The Jewish Bible was a major source for “Mark” but your analysis here shows that “Mark’s” dependence goes beyond kidnapping sentences to (mis)using entire major themes from The Jewish Bible. Once you know what they are comprised of, the infilling which occurred in the writing of the gospels is readily deduced.It is shooting fish in a barrel, as the saying goes. I’m sad to say, few believe it, but is most assuredly true. All falls into place, and exegesis and textual criticism becomes easy. The overwriting of James out of scripture, and John the Baptist as equals to ‘Jesus’, is the reason for the writing of the NT canon. Paul is the one who set the scam in motion. The gospel writers just filled in the pages. I didn’t want the cover photo (above), just to show where the book can be found. I won’t post the Amazon link again, Neil. Anyone interested can email for an epub file (sahansdal at yahoo dot com). What we have in this saying is a citation from the Bacchae of Euripides, in which the persecuted God (in this case Dionysius) speaks to his persecutor (in this case Pentheus, the king of Thebes) as in Acts: “You turn a deaf ear to my words…Instead of kicking against God’s goads as a mortal, you should rather offer sacrifices” (787ff.). But I feel uneasy about the connection (between YHWh to Paul & Dionysis to Pentheus), as “kicking against the pricks/goads” appears to be a common Greek idiom, but Acts 26:14 clearly states that Paul/Saul was speaking in Hebrew, where the Greek idiom would surely have been passing strange. There are at least a couple of places where Gk classics have been incorporated into the gospels. Aesop gets a cameo when “Matthew” has JC quote one of his fables ‘we piped to and you did not dance, we wailed and you did not mourn” [11.17]. Cana in “John” is a retelling of the familiar Dionysian story of priests turning water into wine. Such are integrated elements of the culture of the authors of the gospels. As you say such are ‘common Gk idiom[s]”. If Shakespeare had written in the pre-christian era he would probably have rated a mention somewhere. I haven’t read it yet, got more weeding to do in the garden, just taking a break. I think that I understand what you are saying, but your remark does not seem to bear upon my primary ‘niggle’. As the Gospels were written in Greek, I do expect them to be loaded with idiomatic Greek. But in this particular passage, it goes out of its way to state that Paul is speaking Hebrew when he utters this Greek idiom. It is that discrepancy of someone speaking Hebrew, (which has its own idioms for the concept of futile resistance), that he employed the Greek version, translated into Hebrew. It is not that it is a shared cultural element that bothers me, but that In my opinion) a Jew speaking Hebrew would surely have employed an idiomatic Hebrew phrase. It just makes me suspicious of the provenance of the verse, that is all. I would apply Bayesian analysis to my dilemma, but cannot be bothered at the moment! My gut feeling is that a Jew, speaking in Hebrew, would be far more likely to use an Hebrew idiom than a Greek idiom. That is all that I am suggesting. Even Shakespeare employed English idiomatic sayings in preference to Latinate ones. Simplest hypothesis (and saves you any Bayesian headaches): The author made it up. Also, Hebrew wasn’t a conversation language at the time so it would have been Aramaic anyway. Simplest hypothesis (and saves you any Bayesian headaches): The author made it up. so it would have been Aramaic anyway. But the concordance is clear: “Ἑβραΐς” (Hebraïs) (Dative, singular feminine), not Aramaic, nor Coptic nor Latinate nor Syriac. Definitely and pointedly Hebrew!, to the point where the author felt obliged to emphasise such! In Acts 21:40, 22:2 as well as the currently “under the spotlight” 26:14. These are the only places in which I can find the absolute emphasis on the speaker employing Hebrew. And I keep having to return to this basic fact. One which makes me confident that the passage in question is, as you suggest, a transparent fabrication. I’m pretty sure that, given the author didn’t know he was using a Greek turn of phrase in a supposed Hebrew conversation, he wasn’t knowledgeable enough to know that Hebrew was only a liturgical language at the time and Jews conversed in Aramaic, nor did he know how to tell the difference between Hebrew and Aramaic. That’s complete b.S. Michael. Paul didn’t even KNOW Hebrew. How else would he have gotten the Genesis 15:6 Septuagint version for his faith salvation assertion if he did? He would have read the Hebrew if he could, like any good Pharisee. There’s also 2 Peter 2.4 where the author uses the verb form of Tartarus to describe god casting disobedient angels to hell. I suspect that my attempt at a reply has fallen into the elektron abyss that is the intertoobz. Are you able to elaborate on this verb-form please? I recall watching a doco from perhaps Nat Geo describing the many mechanical devices that Heron of Alexandria constructed and sold to the local and remote temples. Besides his famous clocks, and coin operated holy water dispenser, he also created and sold jugs that accepted water and poured wine. Apparently within this device he had some clever but simple piping and pressure assisted mechanism to achieve this. Im guessing you might be able to find it on YouTube. The reason i mention this is because turning water into wine, was a popular trick that many temples in the ancient world performed. My memory seems to recall the narrator saying that people expected grand amazing things to be seen at the local temple, and this was the business motivator for inventor like Heron. Thus if tricks like this were present, then one could consider them a standard performance that holy men performed, so it makes sense that Jesus was required to also do the same. Much of the gospel is written in this spirit where Jesus is said to repeat a miracle of some famous prophet but on a larger better more impressive way. Perhaps I am thick, but I fail to spot any relevance at all to my original enquiry regarding a supposedly Aramaic-speaking Jew, speaking to a crowd of solely base Aramaic-speaking Jews, employing a privileged Greek idiom where an Hebrew idiom would be far more apposite. Privileged in the respect of being a common coinage amongst the owners of oxen & horses, not that of shepherds, nor camel drivers. One had to be above a common desert herdsman to own cattle or horses. That makes the phrase even more suspect than it at first seems. But Detering wasn’t writing about Paul in this case but about the author of Acts, who was, at least per the Acts Wikipedia, thought to be a Gentile speaker of Koine Greek. Detering doesn’t appear to discuss this case further in his book. It is just one small bit in his argument discounting Acts as presenting anything of historical value, at least with respect to Paul. He asserts that although the author of Acts claims to have known Paul that there are many things showing that he really did not. Detering cited “Bauer” as being “convinced that not only that the Paul in Acts represents an imaginary historical figure, but also that the representation of the apostle in the letters ‘sprung from the same ground of deliberate reflection. '” The “Bauer” he cited was writing in 1850 and is evidently Ferdinand Christian Baur. Correction. As I read further in Detering’s book, I encountered a subtitle “From Baur to Bauer.” The Bauer was Bruno Bauer, who was a bit younger than Baur. Bauer was so radical (for example saying that an historical person named Jesus probably never existed) that he was removed from office in 1842. Good point Michael, I think J.Quinton has the answer. Its similar to the mix of languages [Aramaic and Hebrew] that gospel authors “Mark” and “Matthew” use when purportedly quoting JC’s words on the cross ie Eloi to Eli etc. They muddle things up cos they are not quoting. But that scenario assumes that the gospel authors had no idea of that to which they were relaying or inventing, nor what the idioms should have been.